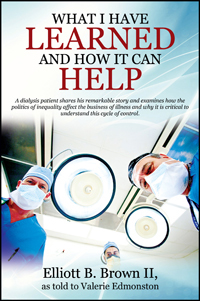 A dialysis patient shares his remarkable story and examines how the politics of inequality affect the business of illness and why it is critical to understand this cycle of control. Learn How Elliott’s Amazing Journey Can Change Your Life! “My life experiences and complicated medical issues, combined with what I have learned, have helped me to understand how it can be better for all dialysis patients.” What I Have Learned is a personal memoir written to help promote awareness and education by using many of Elliott’s extraordinary experiences (both in and out of medical settings) to underscore the significance of the life-altering message he has for other dialysis patients—and for the tax-paying public at large. Divided into eight “stories,” the underlying theme traces his journey from feeling like a pawn in a system that relies on a dialysis patient (consumer) making the life-saving choice for treatment (product)—to questioning the connection between today’s outrageous treatment costs that have netted huge profits for the dialysis industry over the last several decades—to the current lack of treatment options, access to patient education, innovation, or serious interest in searching for a cure for kidney disease. Travel with Elliott on his journey as he also explores– Why a natural disaster in another part of the world woke him up, and became an “aha” moment that inspired him to think deeper about what suffering means. How corporate profiling of vulnerable populations can lead to kidney disease, which, in turn, increases the need for more for-profit dialysis treatment centers. The business of illness and how it contributes to a lack of quality oversight and accountability, recordkeeping errors, and potentially deadly medical mistakes. Personal insights on the importance of patient engagement, self-advocacy, and more! Elliott B. Brown II is a writer, photographer, humanitarian, and dialysis patient who advocates tirelessly on behalf of the rights of other dialysis patients. Valerie Edmonston, founder of The Writer’s Vantage, specializes in writing nonfiction books for business owners and thought leaders. Both writers reside in the Baltimore area.